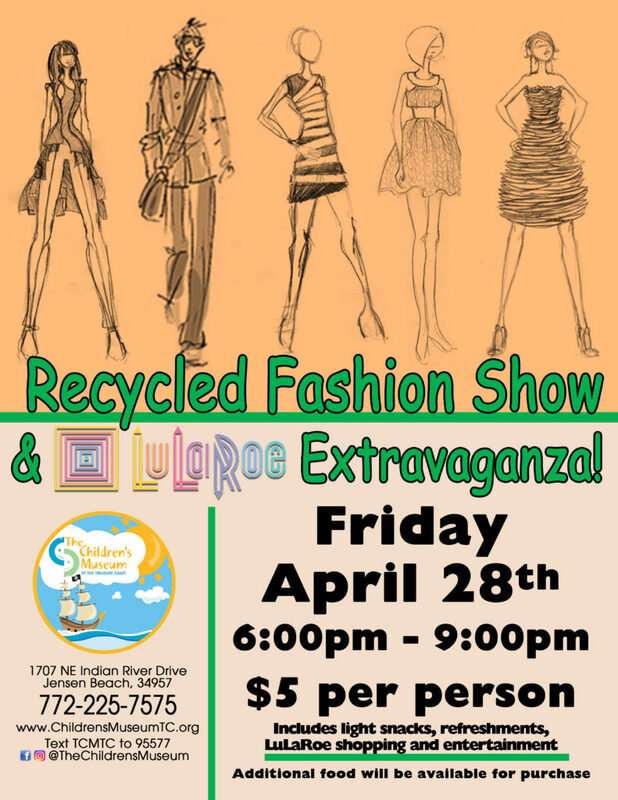 On Friday, April 28th from 6 p.m. to 9 p.m., The Children’s Museum of the Treasure Coast will be having our Recycled Fashion Show & LuLaRoe Extravaganza! Students from grades 3 through 12, and a new category for college students from all over the Treasure Coast, will be rocking the runway in their hand-crafted clothing made from ONLY recycled material. Not only will the models and designers create fashion and art, they will also learn the importance of recycling while and the value of our environment while showing their families and friends in attendance how much fun it can be to reduce, reuse and recycle! The themes this year are “World Wide Wear” “Cirque Du So Stylish” and “Deep Blue Designs.” Designers and models can enter into all three categories for a chance to win 1st, 2nd, and 3rd place for some awesome prizes. There will also be a “Fan Favorite” category where the audience get to be the judge! Food and refreshments, entertainment, music, and the ever popular LuLaRoe will be available throughout the evening. Tickets are $5 per person. To be a participant in the Recycled Fashion Show, or for more details, call 772-225-7575 or visit www.ChildrensMuseumTC.org.